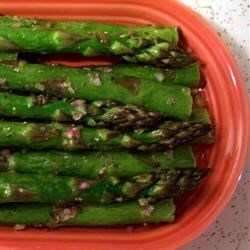 "Asparagus broiled with a Dijon, lemon, and tarragon dressing. The dressing really brightens the taste. Quick to assemble and make." Preheat the oven's broiler and set the oven rack at about 6 inches from the heat source. Toss the asparagus with 4 teaspoons olive oil, salt, and pepper. Spread out onto the prepared baking sheet, and broil in the preheated oven until the asparagus spears are just tender and begin to turn lightly brown, about 8 minutes. Turn the spears over halfway through cooking. While the spears are cooking, prepare the dressing by whisking together the lemon juice, shallot, tarragon, mustard, and olive oil in a small bowl; season to taste with salt and pepper. Once the asparagus is done, place it onto a serving platter and pour the dressing overtop. Make a quick and easy fresh asparagus side dish. I liked this sauce a lot! Kind of like a mixture of bearnaisse and hollandaise! I'll definitly be using this again TY. N*R.